When it comes to designing and manufacturing the plastic parts for your products, you’ve got several manufacturing methods at your fingertips. Before you get started prototyping your part and committing to how your plastic parts will be produced, it’s important to explore your options and find out which method will work best for your needs, from material selection to the speed and scale of parts production. In this comparison, we explore two methods: plastic injection molding and CNC machining. Plastic injection molding produces parts by injecting molten materials – most commonly thermoplastics – into molds, also known as tools. Before being injected, the plastic is heated in the barrel, injected into the mold, moves along channels known as runners, and then into the part itself. Once completed, the mold opens, and the part is ejected, ready to start the process again. Loaded into hydraulic or electric machines, a well-made mold, and the right plastic resin can produce precision parts at a very fast rate. While injection molding is about filling, CNC machining is about taking away. CNC – which stands for computer numerical control – machining is about using computer-controlled cuts removal material from a solid block a layer at a time. This information is pulled from a CAD or similar digital file, allowing for alterations to the files between production. The computer breaks these files down into a series of commands which are fed to one or more milling tools that work on the material to produce the final product. This allows quick transition between digital designs and physical parts. Like with many comparisons between injection molding and other processes (see Manufacturing Comparisons below), injection molding has a higher lead time and costs, but once it gets up to speed can out-perform CNC machining in terms of volume and costs. Some factors to consider. Lead Costs: CNC machining requires the creation of a CAD file and its conversion to being usable for the mill. Injection molding requires the creation of a mold, which takes lead time and money. Speed: CNC machine can go quickly from CAD to creating products, but once in place injection molding can produce parts quicker. Volume: When it comes to price per part, injection molding wins when it comes to volume. 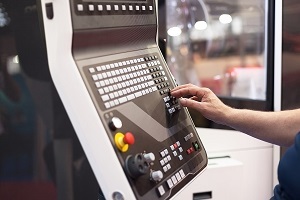 While factoring in start-up CNC milling is less expensive for a few parts up to a hundred, from hundreds to thousands of parts, plastic injection molding emerges as the choice. Materials: Injection molding covers plastics, particularly the two camps of thermoplastic and thermoset resins, covering everything from everyday plastics like ABS to nylon. CNC machining can use plastics or other materials, but due to the milling process softer materials suffer. When it comes to finding the finding the best manufacturing process for your plastic parts, we here at Midstate Mold and Engineering believe having more information to make decisions is always better. Interesting in learning more about your options with injection molding? Feel free to contact us or to directly request a quote today. With more than 180 years of combined experience in injection mold design, tooling, and parts production, we can assist you with every step of the process, from prototype design to making the mold to state-side parts production.